Jelly sandals are shoes that have a strong sense of architecture, combined with large arc, “Zaha” streamlined, hollowed out, colorful and other elements, and made of PVC material as the main raw material, made of the world’s most advanced special soft rubber General name. 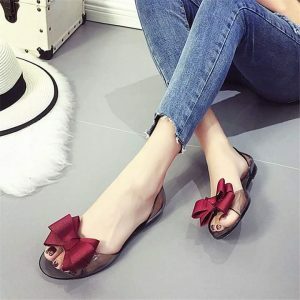 Jelly sandals are relatively inexpensive shoes, and its price is relatively easy to accept, even if the big jelly shoes, in the final analysis, it is still PVC and plastic materials, it is destined that its price will not be too high. In addition to the price factor, nostalgia is also an important reason for many consumers to accept plastic shoes. Recalling the happy time at that time, there is a different kind of fun. From the shoe racks in the international big-name stores to the stalls, there are traces of plastic shoes everywhere! The color of the seductive jelly sandals is cute and casual, but many people are worried about the quality and safety of the jelly shoes. Let’s take a look at whether the jelly shoes are poisonous! The jelly sandals on the stalls are made of plastic material from the sole to the insole. Although there are four venting holes at the bottom of the insole, there is no venting hole in the front. It seems that the so-called stomata are also in vain. 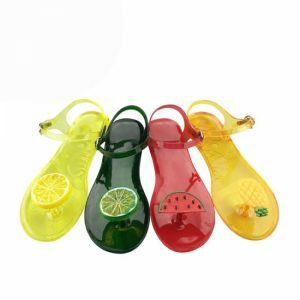 Some experts said that due to the structure and material of jelly sandals, it is easy to accumulate water, and the moisture is not easily absorbed and volatilized by the shoes, and the shoe holes on it can only help the feet to breathe. In this way, the soles that need the most breathable and dry environment to lose their protection. The material of the jelly shoe itself is airtight, and the human foot is sweating. Long-term in a closed state, the sweat on the feet is much, many bacteria, fungi it is easy to breed on the skin, easily lead to many skin diseases, such as athlete’s foot, athlete’s foot. Therefore, when you buy jelly sandals, don’t try to be cheap. You must choose a brand guarantee. Although the jelly sandals on the stalls are the same, the glue used is not reassuring. 1. Fish mouth jelly sandals. The fish mouth style is the most common and the most color, and it can be matched in rainy or sunny days. 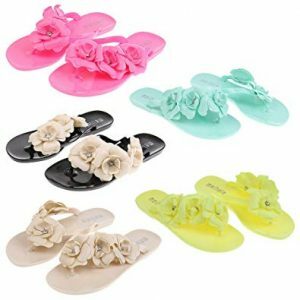 The popularity of jelly sandals also brings high-heeled styles, making noble high-heeled shoes a little girl. Almost every girl has a pair of jelly flip-flops, which are very cute and versatile at home or on rainy days.